Find hotel near Bournemouth Aviation Cent ..
Nestled adjacent to the Bournemouth airport, this beautiful museum gives you an insight of the aviation field of Bournemouth. Visit this brilliant museum to get hands-on experience through various interactive programs where you get an inside view of the local aviation heritage. 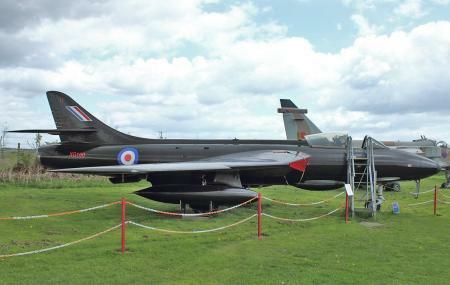 In these programs, you get to sit in the actual aircraft cockpits and also get a close view of the famous English Electric Lightning and Westland Wessex Helicopter. A tour of this museum will be a memorable as well as an educational trip for the individuals of different age groups. Once you are done with the museum, you can pay a visit to the shop to buy some unique gifts related to the aviation field. Those who love aviation can browse through the aviation memorabilia without visiting the museum. However, missing out the chance of visiting the museum will be a lifetime loss. Three to Sixteen years old: £3. Entry is free for children under three years. For groups (maximum 30 people), visit the official website. Oct 26th 2014 to March 28th 2015: Last entry 3pm. By A1 bus from Gervis Place, Bournemouth. How popular is Bournemouth Aviation Center? People normally club together Eling Tide Mill and Littledown Park while planning their visit to Bournemouth Aviation Center. Great museum with lots of information about the exhibits. You are able to sit in the cockpits of most of the planes. Inside, there is a flight simulator for children to fly and land an aircraft. There isn't a cafe here but there is a klix coffee machine. You can buy biscuits, chocolate and ice cream/lollies in the little shop.There are tables and chairs outside if you want to bring a picnic. You can leave the museum and return later if you want to go further afield for lunch. It is well worth a visit. Absolutely fantastic place for plane enthusiasts and children. Most of the aircraft can be entered and there is a lot of them, so you can pretend to be a pilot to your hearts content and see just how much a pilot really has to control beyond the joystick. There is also a fire engine, a helicopter and a double decker bus on site (my kids favourite) so you won’t be sitting still for very long, small kids will need help in and out of half the aircraft so Lee that in mind. Our kids love it so much we got the annual pass which for a family of 4 was only around £60 so anytime it’s dry and they bored we head back here. Grandchildren aged 8 and 5 spent a very happy couple of hours here, climbing into the old planes, pulling levers, pushing buttons, dressing up as airline crew and watching planes taking off from Bournemouth airport next door. Staff at the museum (all volunteers) couldn't have been more helpful, and at £3 for children and £6 for adults this is fantastic value for money.